On its surface, Home Futures — the major exhibition currently on display at London’s Design Museum, curated by Eszter Steierhoffer with Justin McGuirk — appears to be something quite simple. Various objects — drawings, models, furniture, videos — from the 20th century fill the exhibition spaces, presenting ideas of how the future of the home was once imagined. And yet, what could be more complex than the home? A perpetual battleground for ideas of labour, gender, privacy and family, the home is the design object par excellence to consider how we live today. 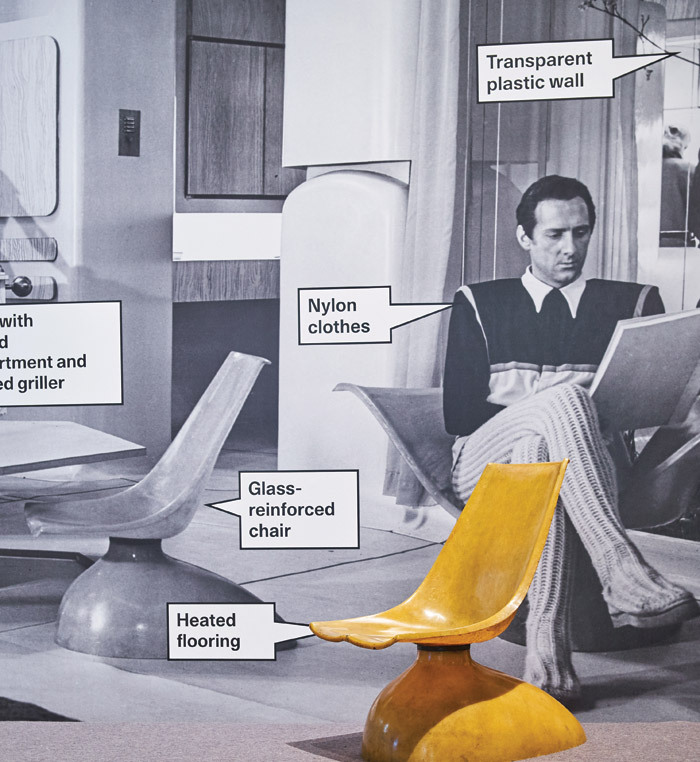 And like transport or communication, changes in the shape, scale and functions of the home are shifting as rapidly as Silicon Valley – or IKEA, who partnered with the Design Museum for the exhibition – can flog their newest products and technologies. 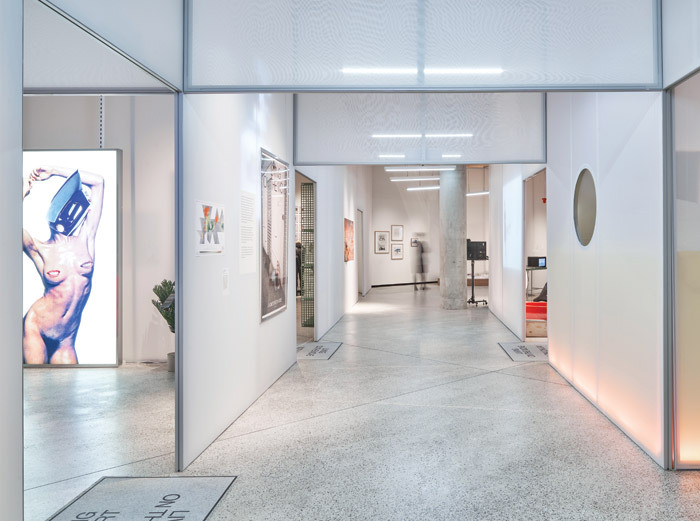 It is from this point of chronological crisis that one enters the exhibition space, a markedly ‘futuristic’ environment of curved translucent canvases designed by New York-based architects SO-IL. In plan, the space is reminiscent of the Smithsons’ 1956 Home of the Future, their proposal for a fully mechanised domestic environment, which appears via models and photographs in the exhibition, and whose rooms curved and opened on to one another within a rectangular envelope. The Smithsons’ project features in the Living Smart section of Home Futures, which, as with the six other named sections, is announced via floor signage and large posters by John Morgan Studio which unintentionally ape the graphic design of Home Economics, the exhibition for the British pavilion at the Venice Architecture Biennale in 2016 that also imagined the future of domestic life. Each section also features contemporary objects or concepts which maintain the ricocheting dialogue between design of the 20th century and today. In Living Smart, a smart hoover is juxtaposed with a 1935 film clip depicting a futuristic 1955, in which a large cooking contraption (and, inexplicably, latex clothing) leaves ‘Plenty of Time for Play’ for the liberated housewife. Another section, Living with Others, brings together the Google Home Mini smart speaker, nattering away to itself in the corner of the room, and Ugo La Pietra’s Telematic House project (1972), an imagined home in which every table, chair, treadmill and mirror are fitted with a screen. 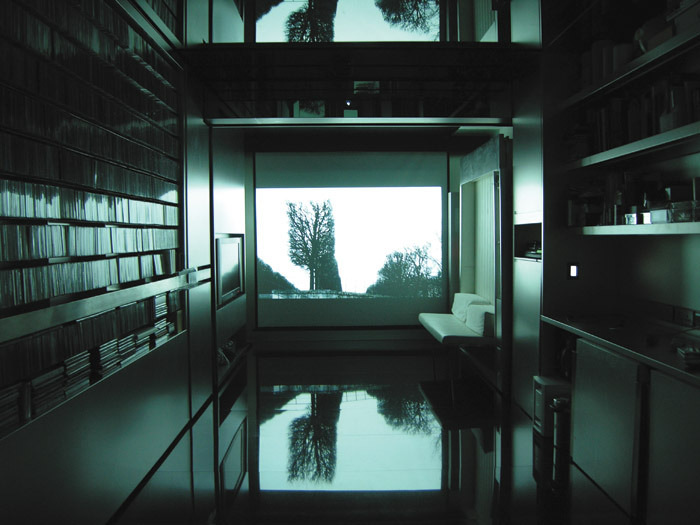 First displayed as part of the exhibition Italy: The New Domestic Landscape, held at New York’s MoMA in 1972, La Pietra’s Telematic House anticipates the dominance of screens in contemporary quotidian life. Yet as the Home Futures curators adeptly make clear, the Telematic House also anticipates a subtler shift in the blurred borders of the domestic environment, whereby the walls of the home are not a container for a separated private realm, but a site of transmission and broadcasting, be that via images shared on social media or via data shared through the Google Home Mini and its peers. For Steierhoffer, the title of the Living with Others section does not necessarily mean sharing space in collective forms of housing — indeed this is not an exhibition about housing — but instead the use of apparatus that connects our domestic lives to other entities, both human and otherwise. Living with Less, another strong section in the exhibition, showcases architect Gary Chang’s extraordinary 32 sq m apartment — a single space that can be reconfigured into 24 different ‘rooms’ — via a meditative video that sees Chang adjusting the home into its different forms. The display is geometrically satisfying, although in a context where squeezing domestic space usually means expanding developer profits, it’s also a little troubling. Brussels-based architects Dogma’s long-term research into domestic minimalism takes a different approach by reframing minimalist rooms as facilitating the socialising of domestic labour. That is, following Dogma’s research and the influence of a 1932 book by Czech critic and poet Karel Teige, by removing certain functions of a living space, such as cooking or washing facilities, and relocating them into communal parts of a collective dwelling, the social and economic burdens of contemporary domesticity can be reconfigured and resolved. Dogma’s work, which is expanded in more detail in the exhibition catalogue, is one of the more directly politicised moments in Home Futures, and one which draws a more continuous line between past-futures and present-futures than some of the other, more speculative, jumps. But that’s not to say these jumps aren’t worth making; some of the show’s more whimsical moments are among its highlights. A section from Jacques Tati’s 1958 film Mon Oncle depicts an ultra-modern home in the Parisian suburbs whose ostensibly useful appliances humorously interrupt interaction between family members. The film clip is accompanied in the exhibition space by a scale model of the house — a curatorial coup for film buffs and architecture fans alike. 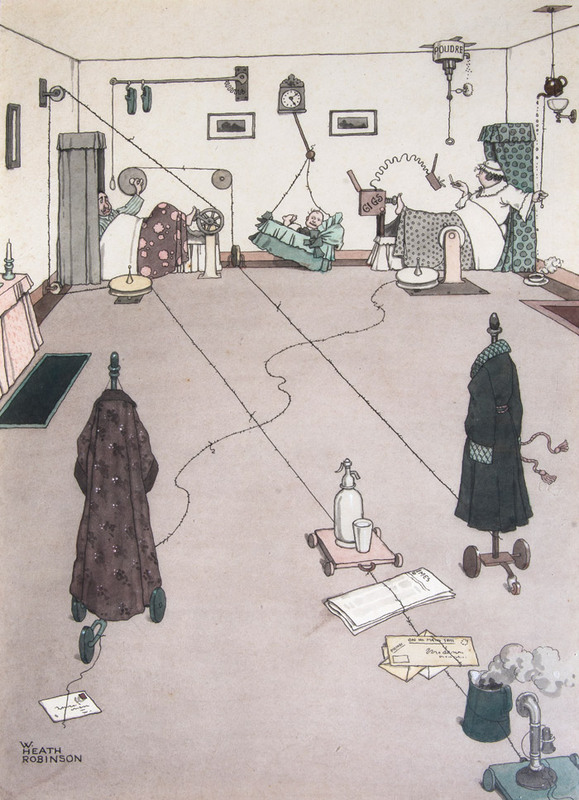 Equally fun (and iconic) are drawings by William Heath Robinson whose warnings on the overuse of technology in the home have resonated since the 1920s. They feel particularly relevant to Uninvited Guests, a darkly comic 2015 film by Superflux Studio shown in the Living with Others section of the exhibition. The film depicts a lonely old man tricking his fictional smart devices to portray a healthy lifestyle: pushing a smart fork around in an uneaten salad or sending out a teenager to complete 2000 steps with his smart cane in exchange for a single Red Stripe (at least the sharing economy is thriving). Underlying these works, from Robinson to Superflux, there is an implicit fear of technology in the home as an invasion of something more essential or primal; namely the more emotional construct of ‘home’. This is glimpsed again in the exhibition’s final moments. A video shows contemporary designers and thinkers — Peter Barber, Kim Colin, Yona Friedman and Anab Jain among them — discuss the home as a more nuanced space of connection than a collection of designed objects. This feels particularly relevant in the light of IKEA’s latest annual Life at Home report, which found that more people than ever are feeling uncomfortable in their own homes. If this signals a crisis in the identity of home, and a failure on the part of those who have been designing our abodes, then perhaps the future role of designers should also be questioned. As 95-year-old Yona Friedman puts it in the exhibition video, ‘A home is an always-moving ensemble of furniture.’ Perhaps what’s more important is what happens in-between.